Hello,Welcome to Our Blog,Hope You Are Good!! 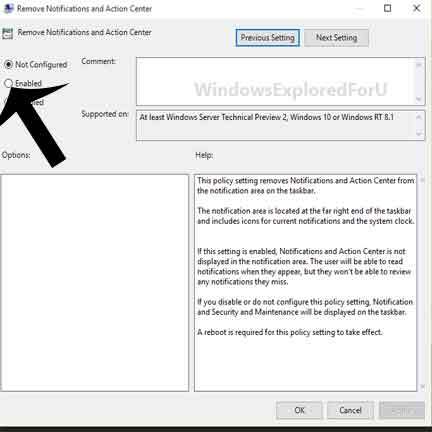 More Which For Users Whom Wish to Enable/disable Action Center in Windows 10. What is Action Center ??? This question will basically arise for most of the beginners..So here is an Answer for it. display the important messages in the form of Action center. How to Enable or Disable ??? frustration to Some Users..So here is an tutorial for disabling it. Step 2 : Press Windows + R Key.and type gpedit.msc->Select->Ok. Step 4 : Click on Administrative templates. 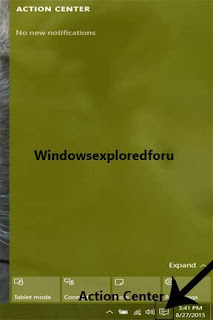 Step 5 : Click On Startmenu and Taskbar. Step 6 : Scroll down and find this Setting "Remove Notifications and Action Center"
Step 7 : Click On it. Step 8 : A Window Will Open,Click Enabled->Ok->Apply. "If You Wish to enable Action Center ,Click On Not Configured,OK->Apply"
Step 10 : Restart or Sign in again for Changes to take Effect. 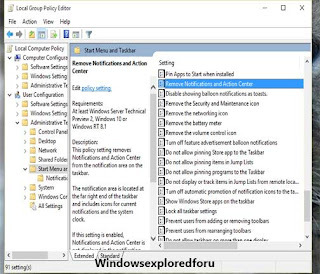 How to Enable/Disable Aero shake In Windows 10. Logesh August 27, 2015 Let me Share my thoughts!